A crisp sourdough loaf is cut, stuffed with shredded cheddar, crisp bacon and drizzled with a buttery ranch sauce before being baed to golden brown perfection. It's an appetizer for the ages. Grab a bread knife and slice from side to side in both directions, leaving about an inch of space between each slice. Make sure that you don’t cut all the way through the bottom of your bread. Stuff the cheese and diced bacon pieces between all the cuts in the bread. Melt the butter, combine it with the ranch dressing mix and garlic powder. Drizzle it over your bread. 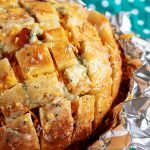 Wrap the loaf of bread in aluminum foil and cook for 20 minutes or until all your cheese is melted.